. J. Crew Toothpick Jean in Classic Rinse Sits at hip. Midrise. Fitted through hip and thigh, with a super skinny, ankle length leg Dark wash. Style B0755 Size 24 Approx measurements: Rise: 8" Inseam: 27.5" Excellent preowned condition! Leg opening 8.75. leg opening straight across hem, then. front rise 7. front rise from the crotch to the top of the waistband. 77% cotton, 23% elasterell-p. inseam from crotch to the bottom of the hem. J. 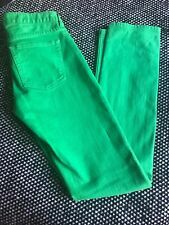 Crew toothpick jeans Fun bright color Great for petite sizes Tiny, barely visible stain on bottom right corner of left back pocket (please refer to last picture) Otherwise, excellent condition! Bright blue, "Matchstick" style jeans by J.Crew. Light, normal signs of wear. Overall very good condition. Ankle length. •13" across waist. •24" inseam. Front rise 7. leg opening straight across hem, then. front rise from the crotch to the top of the waistband. inseam from crotch to the bottom of the hem. leg opening 10. style A2484. waist flat across, then. • TOOTHPICK SKINNY. • DISTRESSED STYLE, BUT NOT TOO MUCH. • LIGHT BLUE DENIM. Perfect fun color for the season! These are broken in Boyfriends, very soft and comfy. Can be cuffed or uncuffed. Length of 28" inseam is uncuffed. length overall: 38". leg at top:18. J crew Woman’s Jeanssize 24. 10 0% Cotton. Length: 28. Condition: like new. Inseam 26". 1% spandex. 99% cotton. Style: Matchstick Jean. Details: Jeans are RED. FIVE ⭐️ FASHION. Size: 24 Regular. Leg Opening: 12”. Waist: 27”. Inseam: 30”. Black toothpick skinny jeans worn stretch from J. Crew! This classic & versatile item takes you from the workplace to a night out, to a casual lunch. Ankle opening: 5”. Waist: 14”. Care Instructions: Machine wash cold inside out, tumble dry low. Length: 36.5" waist to hem. Color: Blue (dark wash). YOU are my #1 priority! 28" inseam. Letter and number at the end of the title are for inventory purposes. Excellent condition! Beautiful pair of gently used jeans from J Crew and Liberty Fabrics! Pants are 98% cotton, 2% spandex, machine washable. Approximate measurements are: Waist: 30" Inseam: 27.75" Total length: 35.25"
Style #16006, Spring '14. The lines down the front and back of legs are part of the design. otherwise excellent pre-loved condition! Inseam 29". Waist 15" (30" overall). Waist 14" laying flat. inseam 26 1/2". Stretch Skinny. Denim Blue Jeans. J Crew Jeans 24 09355 White Toothpick Skinny Stretch. Condition is Pre-owned. Shipped with USPS Priority Mail. SKU# 2p / location: X10. - material is 98% cotton, 2% elastane. - No holes or stains. 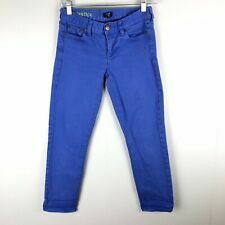 J Crew Matchstick Size 24 Blue Jeans. 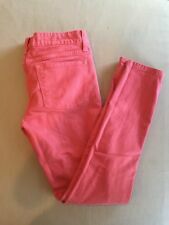 J CREW MATCHSTICK STRETCH JEANS 24"
Sold out J. Crew Matchstick jeans in classic rinse. These were worn twice. BOYFRIEND JEAN. Waist across laid flat 14". Inseam 30". J. Crew high waisted raw hem, slim boyfriend jeans are tailored perfectly for you, with an easy fit through the hip and thigh, and a slim leg. Front rise: 9 1/2"; inseam: 26"; leg opening: 13 1/2". Button Fly front. Lookout High-Rise Skinny in Sanford Wash. "Our skinny toothpick jean a higher rise = a nipped waist and legs for miles (even without heels). Dark blue whiskered and faded wash. Machine wash. Cotton with a hint of stretch. Intimates and Sleepwear. Designer/Label - J Crew "Toothpick". Style - Cropped Skinny Jeans. Size - 24 Ankle. Wash - Machine Wash. We have a large selection of clothing, shoes, belts and handbags. With over 2000 of the most desirable labels in our inventory, you’re bound to find lots of rare and hard to find pieces as well as common necessities. Material: 99% cotton, 1% spandex. Good condition with no stains or holes. The pink is a different shade in certain areas of the legs. I always answer within 24 hours. Good condition. Very nice color. No rips or stains. Size 24. Measurements laying flat: 28” waist, 27” inseam. Great condition. The pictures provided are of the actual item for sale. Friendly Service! Worn Once! zipper and button. J. Crew Matchstick jean in 'Luella' wash. Size 24. Beautiful medium wash with factory fading and whiskering. Skinny fit. Great pre-owned condition. Approximate measurements (laying flat): Waist - 13" Rise - 7.5" Inseam - 29"